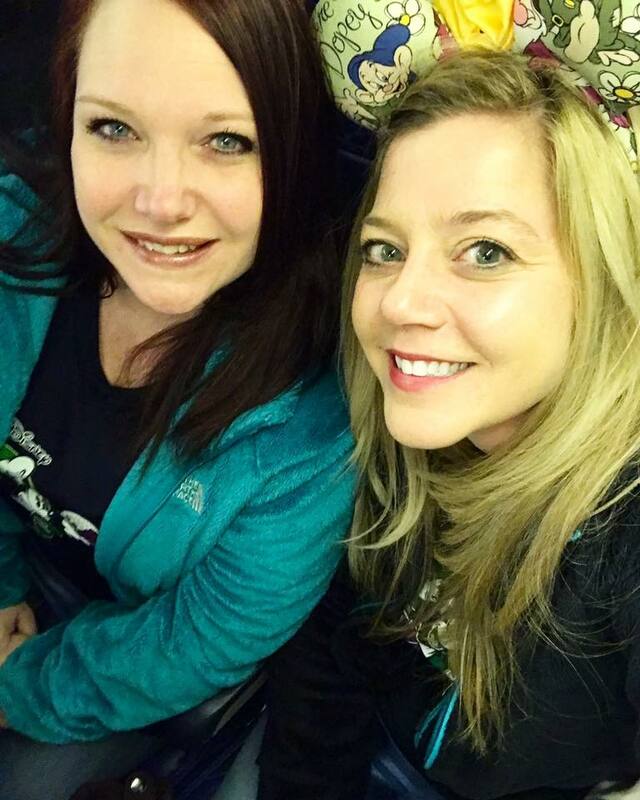 And here we go, the first of many recaps about runDisney’s 2018 WDW Marathon Weekend starting with our arrival day on Tuesday, January 2nd! It was seriously hard to believe that the day we’d been waiting for since … oh, when did we register? 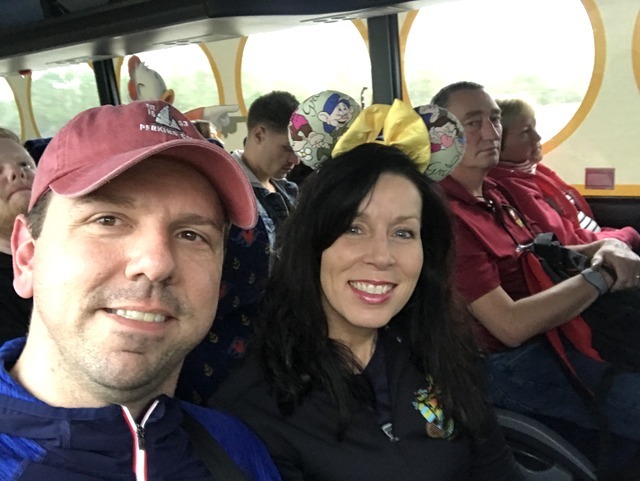 Wow, last February … had finally arrived and we were about to kick off our Dopey Challenge! I was so flipping excited. Not following my own advice and practicing what I preach. Anyone who’s watched my videos or read tips posts knows I’m always preaching to pack EARLY! Be finished with your costumes EARLY! Do everything EARLY so the day before your departure, you’ll be calm, cool, and collected! For most of last year, I lived in a constant state of chaos, never on time, never ahead of the eight-ball, always in this mad frenzy to catch up rather than live in the moment. After finishing Vlogtober with Heather, I went through some major blogging/vlogging burn-out. Then came the Avengers Half Marathon. Then our family cruise. Then Christmas followed shortly by Dopey. To be clear … I’m SO not complaining. Last year was AMAZING and I’m beyond grateful for our many blessings. But I felt continually out of control and I’m still bothered by the fact that I didn’t finish a manuscript in 2017. I wrote half drafts for two different novels, but didn’t finish. And on New Year’s Eve … rather than spending time with my family, I was down in our basement, frantically finishing costumes and burning myself with the glue gun a thousand times. Yeah. Some major frustration, there. I slept good, y’all, on Tuesday night and each night in Disney, a major first for me. Departure morning was stressful, though, after my husband realized our business license would expire while I was in Disney. Getting that yearly application through is always a painful chore, but it had to be done … since our business is what pays for my shenanigans! We hit the road 45 mintues late but thanks to no traffic, it was smooth sailing. BWI however? Not smooth sailing. I had never seen such crazy lines there and with only 40 minutes until my flight, I was entering full freak-out mode. Thank goodness I made it to the gate with minutes to spare before boarding … and with some McDonald’s breakfast and coffee. Priorities. Fast forward about three hours. Jackey and Shannon had already arrived hours earlier and I was finally boarded on the magical Magical Express. Who then taps my shoulder? Rob! Two-thirds of the Joyful Miles gang were reunited! We were both still stressed, though … me from my morning chaos and continued worries about the weather and him from a hellish experience with his hired driver who got stuck in his icy driveway. After blowing off some steam, I declared that once we made it to All Stars Movies, that was IT, I was going to CHILL OUT and RELAX with absolutely NO MORE grumbling and worrying! Yeah. Again. That didn’t exactly happen. Can’t say I regret that, though. We then headed to our room where Jackey and Shannon were waiting. 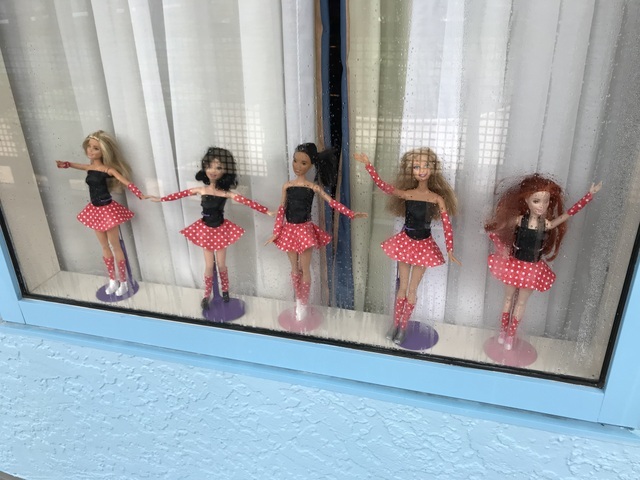 We chatted, vented, and filmed for YouTube until our friend, Leslie arrived, bringing with her these adorable Barbies she customized just for our Dopey Challenge! Now, the plan had been for us to hit rope drop at Animal Kingdom the following morning before going to the Expo. We’d make a mad dash to Flights of Passage before the lines got too crazy since none of of had fastpasses. But nope, that wasn’t gonna happen. 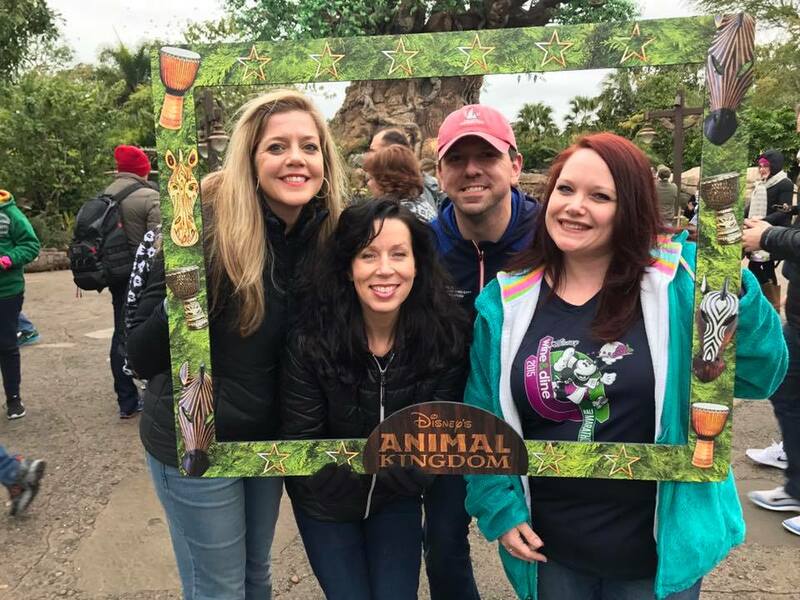 The weather forecast was cold and rainy for Wednesday morning so instead, we decided to venture out to Animal Kingdom that afternoon and ride Flights of Passage on Standby, regardless of the wait. Any guesses on how long it took? 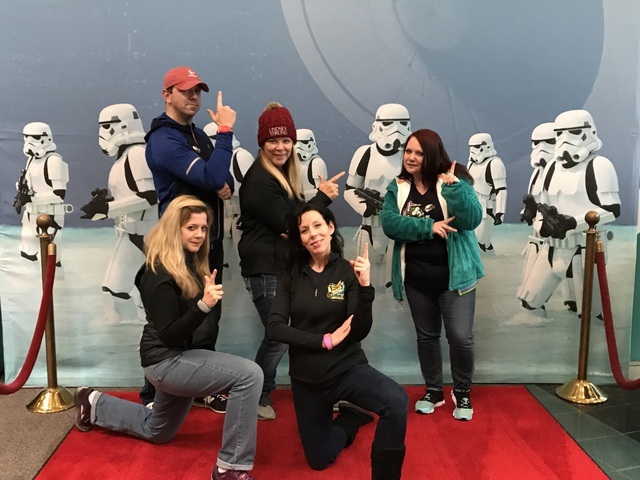 But first, our traditionally stormtrooper pose! 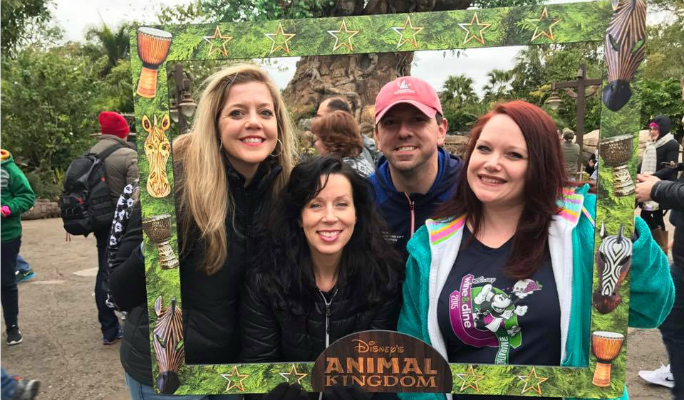 Going to Animal King was a fantastic decision, because who did we see after going through the turnstiles? 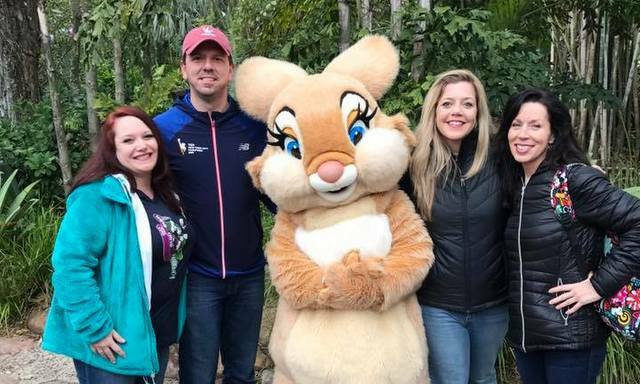 Thumper and Blossom, what??? How awesome was that!! And ya gotta love Photopass. Now, somewhere along the way, we rode Expedition Everest on standby … maybe first thing? My memory is fuzzy here. But I do know that Rob, Shannon, and I did hit the Dawa and Thirsty River Bar for another round of beers. Since it has carbs and all. Afterward, we headed to Pandora, which I’ve been SO EXCITED to see ever since its opening! I’ve already been listening to the Pandora World of Avatar Are Music Loop for months while writing, (it’s playing at this very moment,) so being able to see Joe Rohde’s gorgeous creation while hearing those now-familiar songs was simply magical. 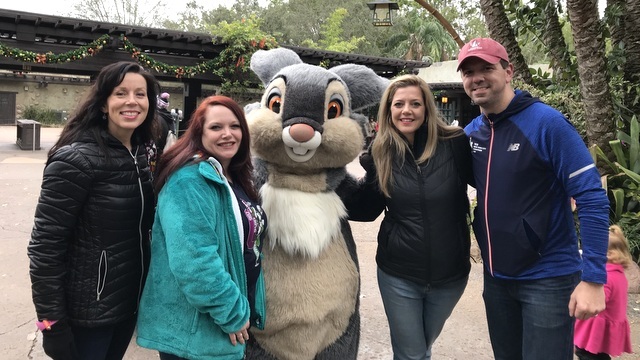 Rob and I had fastpasses for Na’Vi River Journey so we rode that while Jackey and Shannon hit up DINOSAUR and a character photo with Donald. I have to say that while Na’Vi River Journey was very gorgeous and well designed, it lacked Disney’s signature theme of always telling a story and had I waited hours standby, I would have been disappointed. Still, it was warm inside and very relaxing so I’m giving it a thumbs-up … with a Fastpass only. We soon met up and ventured toward Avatar Flights of Passage to wait in the standby line … and oh my gosh, what a line it was! I’m talking an expected four hours. And have I mentioned yet how COLD it was?? No? Well, it was cold. Seriously cold with a raw chill that cut to the bone and set your teeth to chattering. But still. We’d have plenty of time to chat and waiting standby seemed like a much better option than waking early and doing rope drop in the rain. Oh my gosh. It went on FOREVER and didn’t seem to have ANY end and although it only ended up being a two and a half hours, there were many times when the Joyful Miles gang felt anything but joyful. And poor Rob. He had to pee something mighty fierce. Oh. My. Gosh. YES, a thousand times YES!! So much so that Flights of Passage may very well be my favorite Disney World ride now … or at least tied with Hollywood Studios’ Tower of Terror because come on. That’s perfection. What I enjoyed the most was hearing the laughter and cheers from the others beside me. Being able to touch someone so deeply, taking them out of this world and into a magical setting for just a little while, is true genius. Bravo, Disney and Joe, bravo! And have I mentioned yet how poor Rob had to pee? Yeah. Having that ride press against his stomach didn’t exactly help the situation so after it was over, he had to make a frantic beeline for the bathrooms. 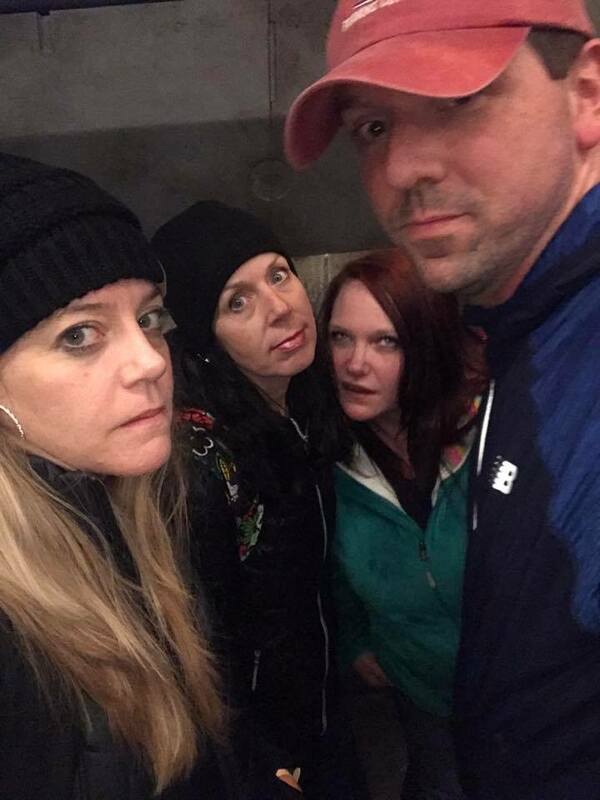 And seeing as how Jackey, Shannon, and I are true friends, sympathetic to the dismay of others … we laughed the entire time. I can’t remember when we left … let’s just say it was late … but we chatted with our last arriving roomate, Anne, before turning in. Rob, Shannon, Jackey, and Anne decided to venture out in the rain the next morning for breakfast at Kona, but Leslie and I chose to sleep instead. And boy, were we going to need that sleep for the Expo mess that lay ahead, which will be the topic of our next post! But for anyone considering the Dopey Challenge in the future, I can’t recommend arriving a day prior to the Expo enough. It gave us a chance to settle in and gives a bumper day in case there’s bad weather at home and airports are closed, something that happened to many of our friends. 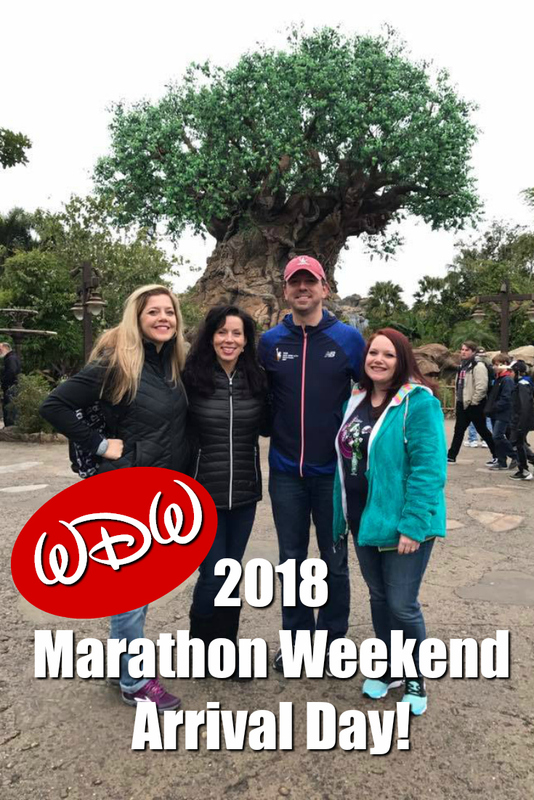 QOTD: Did you participate in runDisney’s 2018 WDW Marthon Weekend? If so, what did you do on your arrival day? We went to Epcot and then Magic Kingdom on arrival day. I agree with you about getting there two days early…it definitely helps us settle in! Absolutely, plus there were so many folks that couldn’t travel due to bad weather! That’s pretty much a must for Dopey now for me. Plus no more switching resorts!! Too much stress! That’s awesome!! I’d love to spend the holidays at Disney although the crowds scare me. 😉 Glad you had such a great time and your stars aligned! Next post: Podcast Episode 35 Part 4: The WDW Half Marathon, Day 3 of the Dopey Challenge! 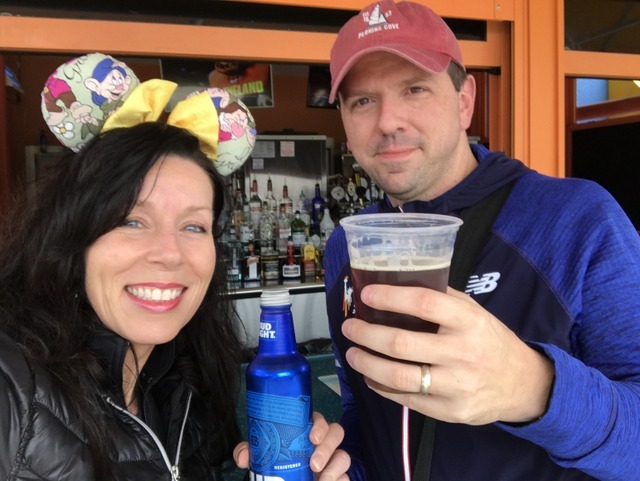 Previous post: Podcast Episode 35 Part 3: The WDW 10k, Day 2 of the Dopey Challenge!